The Phuket Elephant Sanctuary is a joint partnership between Mr. Montri Todtane, a previous Phuket elephant camp owner and world-renowned elephant rescuer and conservationist Lek Chailert, founder of Save Elephant Foundation. Following the success of Lek Chailert's highly acclaimed Elephant Nature Park in Chiang Mai, the Phuket Elephant Sanctuary is the first of its kind in Phuket and seeks to meet the highest standard in animal welfare : rescuing, retiring and rehabilitating elephants that have suffered from working in the trekking and logging industries. Over the past 10 years, Lek has been a driving force of change in the industry by inviting elephant riding camp owners to embrace change through the Save Elephant Foundation's 'Saddle Off' program. Although there is still work to be done, her continuous and tireless efforts have resulted in many camp owners approaching the Elephant Nature Park to learn more about elephant welfare and ethical tourism. Born not far from where the elephant sanctuary is located today, Montri grew up in a rural village without electricity. In his early years, he would visit his grandfather’s rubber plantation and tap the trees to earn just 40 cents a day. Montri cherishes fond memories of these days at the site that is now the Phuket Elephant Sanctuary. After studying Sales & Marketing at the Ram Kham Haeng University in Bangkok, Montri worked in the city of angels until the economy collapsed in 1999, forcing him to return home to Phuket in 2002 to work alongside his uncle as a presenter for a snake show. In 2004 when the Tsunami struck Phuket and caused a major decline in the tourism industry, Montri yet again moved, this time to Siem Reap where he would use his knowledge to work at a Korean owned snake show company. However, when his former employer decided to change his business model and started killing snakes for soup for Korean tourists, Montri, who did not agree with this practice decided to move back to Phuket which had started to recover in 2006. It was not until 2010 that Montri got involved with elephants as he bought Madee, the first elephant for his new camp in Patong, followed by another three gentle giants - Kannika, Tubtim and Dawrerng. He had purchased Dawrerng when she was 45 years and later sold her to another camp where she passed away many years later. Montri says if she was still alive he would buy her back to live at Phuket Elephant Sanctuary. Tubtim, another one of his elephants also started suffering from a hind leg injury. Despite stopping to work her and immediately arranging veterinary care for an entire year, Tubtim’s condition did not improve as expected, and Montri decided to sell her, however this time he insisted that his beloved elephant would find a new home in a sanctuary. This is when Montri’s and Lek’s paths crossed. 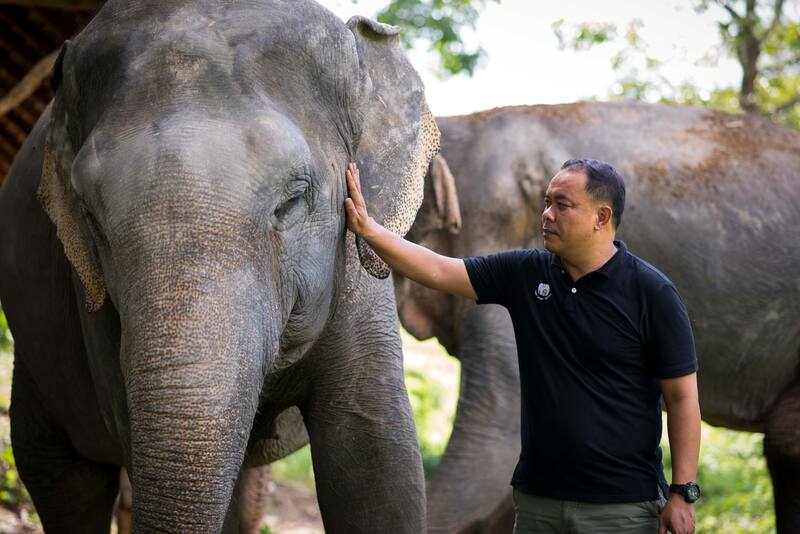 As the founder of the Elephant Nature Park in Chiang Mai, Lek Sangduen Chailert swiftly traveled down to Phuket to meet Tubtim and promised she would never work again. Eager to verify that Tubtim was indeed well taken care of, Montri visited the Elephant Nature Park in Chiang Mai, and the first discussion to establish an ethical elephant sanctuary in Phuket took place. Born just 2 hours north of Chiang Mai in a small hill tribe village called Baan Lao in Northern Thailand, Lek grew up surrounded by animals and opportunities to spend time with them. Her grandfather was a tradition healer, also known as shaman, who helped not only the people in his community but also injured or sick animals brought to him by the villagers for healing. Lek had the opportunity to witness many of these healings first-hand and was even allowed to participate in his work. It was through these experiences that Lek learned that all animals strive to live well, and consequently she decided to dedicate her life to saving animals. Lek has a special passion for elephants, yet she strives to create a loving new home for every animal that is lucky enough to cross her path. With a profound love and deep respect for Thailand’s national symbol, and the knowledge that they were becoming endangered, Lek started her journey to fight for the rights and wellbeing of the Asian elephants in Thailand. Being a promoter of positive change in the way that both domestic and wild Asian elephants are treated turned out to be no easy feat given the industry’s deep tradition and lack of education on animal welfare. However, her unwavering commitment and tireless work paid off as she is now internationally known as a voice of change. In addition to several documentaries produced by National Geographic, Discovery, Animal Planet and the BBC, Lek has also won many honorary awards over the past 10 years. Lek’s work and passion continues to inspire all those committed to helping animal welfare and conservation, both in Thailand and beyond. Her mission to save the Asian elephants has also expanded as she founded the Save Elephant Foundation and brought together a dedicated team that works tirelessly by her side to protect the Asian elephant. Secretary of State Hillary Clinton invited Lek to Washington, DC in 2010 to honor her as one of six Women Heroes of Global Conservation. In addition, she was named one of Time Magazine’s Heroes of Asia for her work in conservation in 2005, the Ford Foundation’s “Hero of the Planet” in 2001, and The National Geographic documentary Vanishing Giants highlights Lek’s work with the Asian elephant and was recognized by the Humane Society of the United States with the Genesis Award in 2003. Lek has also earned honorary degrees from Rajabhat Chiang Mai University. 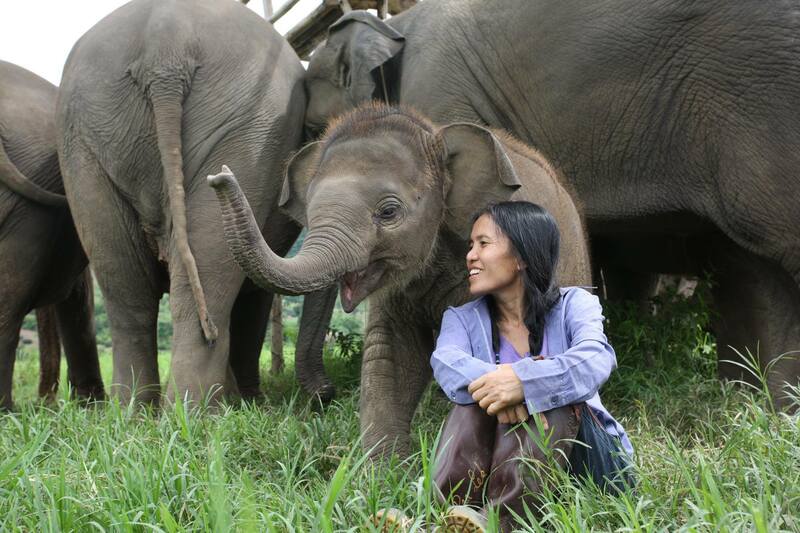 Lek remains a driving force in the elephant and animal rights movement, raising international awareness and motivating other countries and projects to follow her path. Most days, she can be found at Elephant Nature Park spending time with her beloved rescued elephants.